Decanter deadlines – dont' miss them! It is well known in the industry that Decanter are strict about the importance of their contributors meeting their deadlines. After spotting the small troupe of snails there was speculation that we would be enjoying snails for lunch once the hard work of tasting had been completed. However, it soon became clear that there was a darker story here. 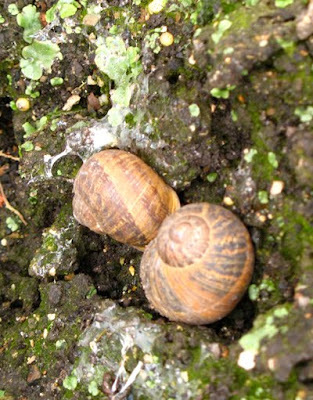 We learned that at least two of the troupe of snails are former contributors to Decanter who were endemically late in providing their copy. In an attempt to encourager les autres they have been transmogrified in a decidedly Kafkaesque fashion into a pair of escargots! 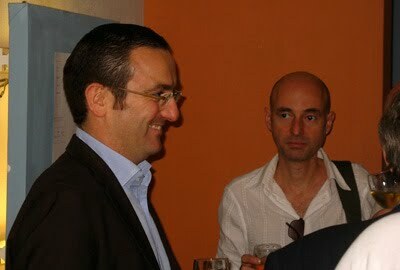 Now which two distinguished Decanter contributors are no longer seen...! 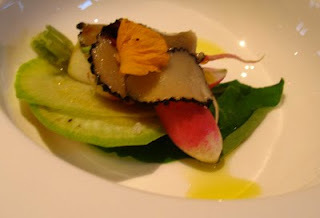 Opened last night, this initally had quite a vegetal character with some asparagus notes. However, with a little bit of aeration this declined, although it did not disappear entirely. There is attractive ripe, zingy fruit here. All very typical of the 2007 vintage with quite marked but clear precise acidity in the finish. 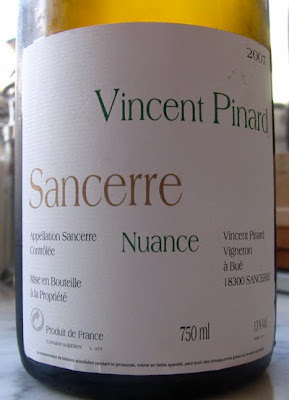 Lovely classic Sancerre! This morning we had 34 wines from Terres Blanches (clay-limestone) to taste. 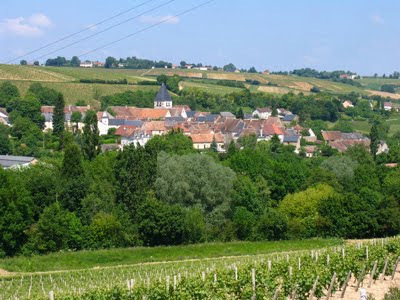 The Terres Blanches are mainly the steep hillside vineyards like Les Monts Damnés, La Grande Côte and the Clos de la Poussie. 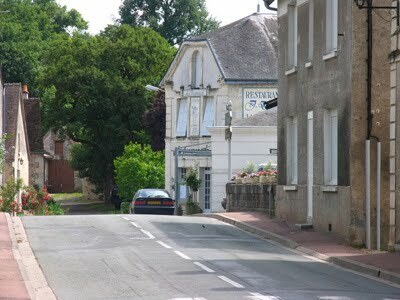 Wines from this terroir tend to be the longest lived from Sancerre but are often initially closed – much less forward than those from the Caillottes. 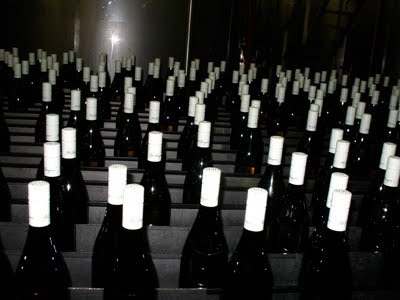 Of the 34 there were five that were corked, which is an extraordinary high rate of 14.70%. Although this one can hardly draw conclusions from just 34 wines, this does suggest that the Sancerrois ought to be considering whether their wines wouldn't be better under screwcap. They might also show greater vibrancy. 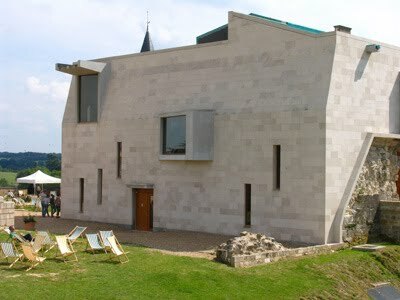 June 2010: at its worst! Weather stats on Météo-France for Tours show that taken in the round June 2010 wasn't as bad as it seemed at the time, helped by better weather over the last week/ten days. With today forecast to be dry and sunny, the total June rainfall will be 54mm, with no rain recorded in Tours since 17th June. The average in the period 1971-2000 was 46.7mm. Average mean temperatures at 12.8˚ are above the average of 11.5˚, while the hours of sunshine are down (NB figs for 29th and 30th June yet to be added) at 181 hours compared to normal 215 hours. However, still well above the record low of June 2007 of just 142 hours. At the offices of Decanter magazine today for a tasting of 2009 white Sancerres. Out of 81 wines we tasted on the first of two days – eight tasters tasting 40 wines each – only 5 or 6 were closed with a screwcap. Dr. Damian Martin of the Wine growers of Ara, who happened to be visiting Decanter's offices that day was surprised at how few there were. In a tasting of New Zealand Sauvignon Blancs all, with possibly a rare exception, would have been screwcapped. 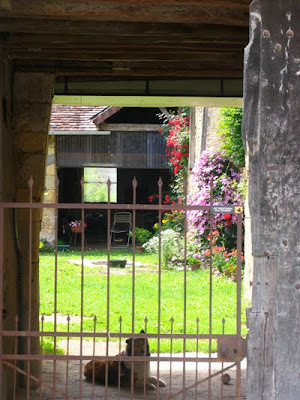 In France the on-trade's resistance to scewcaps has so far proved a decisive block on their use. We had a few corked wines today and, at home, we certainly had a corked bottle of 2000 Cabernet, Clos Roche Blanche. Initially it seemed just rather disappointing and rather past it but as the air got to it the malodorous cork came out in its full splendour and the wine went down the sink. 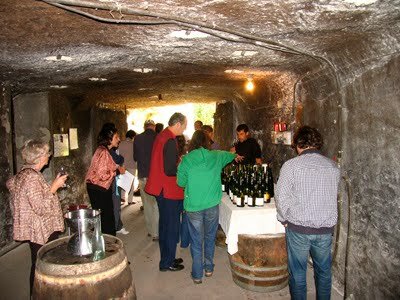 Tomorrow we have about another 60 Sancerres to taste – 30 each. At Chossay the results have been OK, some flowering was finished before the bad weather hit, some after. 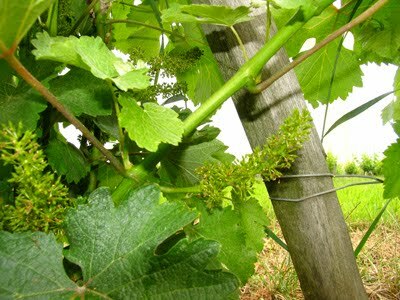 The Côt seems to have been the most affected, with smaller bunches on some of the vines. Apparently this is one of the varietals which suffers most from Coulure. Elsewhere all looks normal, as the attached pictures show. There was a very good “sortie” so some green harvesting may be required. A very hot spell (31 C +) has just closed with a welcome light shower, thankfully no storms here – although the season has just started. 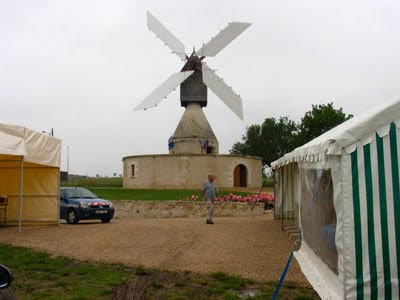 * Certainly much of the first half of June in eastern Touraine was cold and frequently damp. 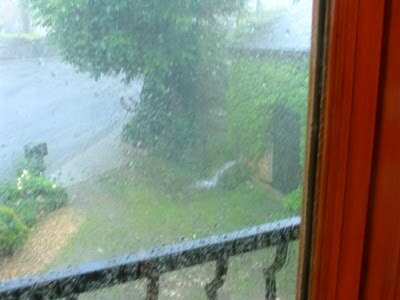 On 19th June it was only 11.5˚C at 11.30 am. 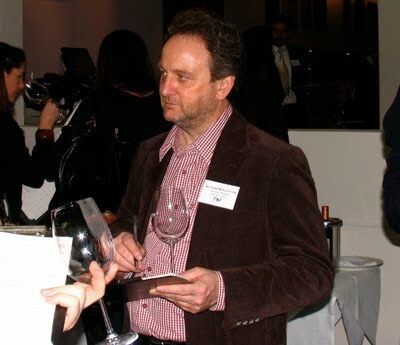 Mark Robertson is the owner of Clos Chossay, its chief viticulturalist and regisseur. Will be at a big two-day tasting of 2009 Sancerre Blanc on Tuesday and Wednesday at Decanter magazine's offices in Southwark. Will be very interested to see how the wines are tasting in comparison with those I tasted at the beginning of June in Sancerre. Writing up my June Central Vineyards' tastings is a task for earlier July. Two reds (Pinot Noir) from the Central Vineyards tasting I did at the beginning of June: both from the 2008 vintage with one coming from Sancerre and the other from Menetou-Salon. 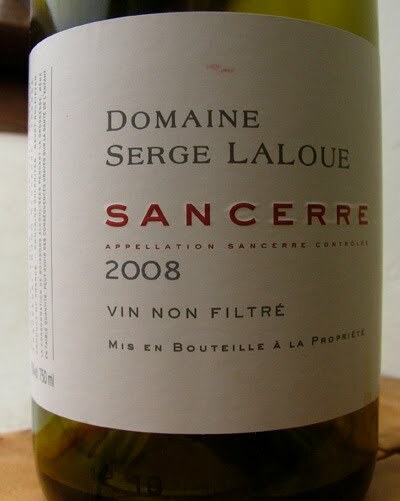 The first was the medium weight Sancerre Rouge from Domaine Serge Laloue with bright attractive red fruits and red to drink now and probably best drunk young. 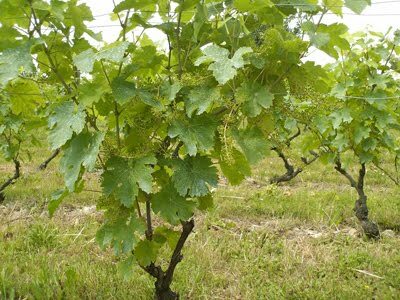 The fruit comes from vines around 25 years old with a yield of just over 40 hl/ha. 50% is aged in 600 litre barrels and 50% in vat. 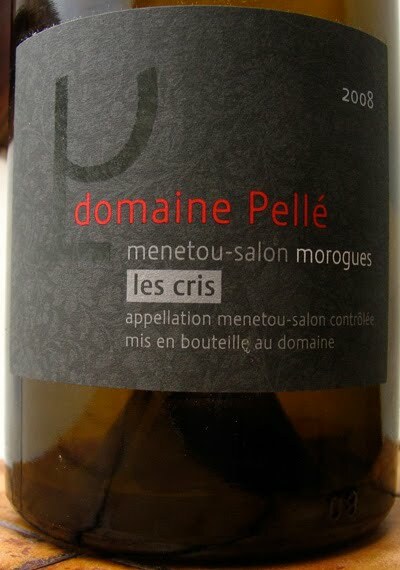 The second, Les Cris, was from Domaine Henry Pellé and underlines this estate's claim to be considered the best estate of Menetou-Salon. The 2008 Les Cris has more concentration and complexity than the Laloue and, although it is enjoyable to drink now, will surely be better in two or three years time. Domaine Pellé now has 40 hectares and makes four reds: a straight Menetou-Salon, a Menetou-Salon Morogues (the commune where the domaine is based). Les Cris and, in 2000 and 2004, Z Coeur du Cris. Both Les Cris and Z Coeur du Cris are aged in barrel. A very enjoyable lunch last week with Jean-Ernest and Liliane Sauvion at their lovely Western Touraine retreat, we drank a quarto of Chinons – one from 2007 and three from the 2005 vintage. A very enjoyable bottle of Château de Targe, Saumur Mousseux (70% de Chenin Blanc, 30% de Cabernet Franc) as an apéritif to prepare our palates. We tried them blind. First up was the dense, powerful and well structured 2005 Vieilles Vignes from Philippe Brocourt in Rivière on the south side of the Vienne. I guessed that this was either 2005 or 2006 and said that I like the concentration but that it needed more time. Brocourt is not a producer I know and we were impressed, especially as it costs around 7 or 8€. The second Chinon was both lighter in colour, less structured, softer and more ready to drink. I guessed wrongly that it was older. I should have thought that it might be a 2007, which indeed it was – the Coteau de Noire of Philippe and Claude Alliet. 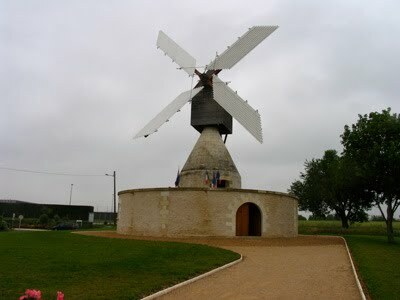 Although it was well made its price tag of some 20€ made it less good value than the preceding Brocourt. Admittedly, however, we are not comparing the same vintage and the cost of production is at least the same, if not more, in a difficult year like 2007. Furthermore Philippe Alliet has a deservedly high reputation built up over a number of years, so can fairly charge a relatively high price for his Chinon. The third Chinon – 2005 L'Angelot, Domaine de Beauséjour from Gérard and David Chauveau in Panzoult – was our least admired wine of the four. 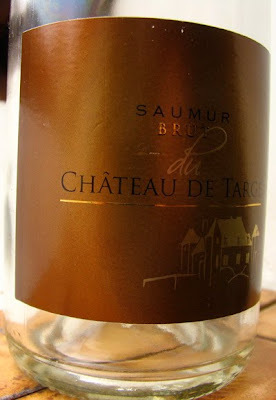 Less concentrated than the Brocourt with more acidity and some dryish tannin, it was also the most rustic of the Chinons. We finished with a very recognisable flange bottle – could only be a Couly-Dutheil. I guessed 2003 Clos de l'Echo because of the rich, concentrated, soft but slightly cooked fruit with some granular tannins in the finish. In fact it was the 2005 Clos de l'Olive. La réclame invite les clients à se rendre compte de l'utilité essentielle de ses produits. Un magasin comme on en fait plus, avec un choix considérable à faire pâlir le service marketing de n'importe quelle multinationale, vous est ouvert. La qualité supérieure des articles loufoques, dingues et finalement pas tant que cela, de la « Quincaillerie Parpassanton », témoignent de sa capacité à satisfaire les demandes, des plus simples aux plus extrêmes. Mer, campagne, montagne, jungle, désert, volcan, lune, tout est prévu pour chacune de vos destinations. Objets assez inénarrables qui ne manqueront pas de vous surprendre et vous enthousiasmer. On trouve tout chez les Parpassanton, même ce que d'aucuns auraient imaginé. Un vrai bol d'air dans le consumérisme ambiant. 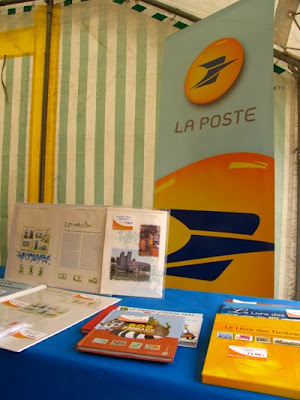 Spectacle tout public et gratuit. 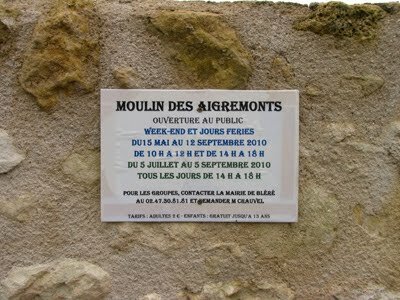 Attention, comme le spectacle démarre tôt en fin d'après-midi (à partir de 18 h), ne ratez pas le début ! The always enthusiastic Philippe Germain was over in London this week and on Tuesday evening presented a short range of his wines at the RSJ. 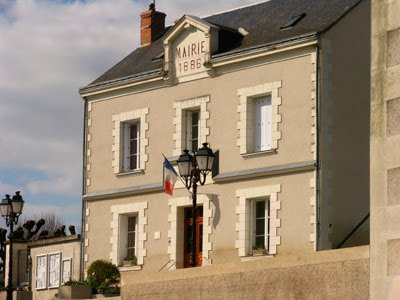 Philippe moved from Bordeaux in 2001 and initially worked with his father, Bernard, selling the range of Germain wines that included Château de Fesles that was subsequently sold to Grands Chais de France. 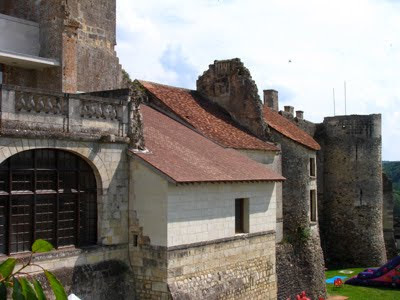 In 2006 he acquired the lovely Château de la Roulerie in Saint-Aubin-de-Luigné in one of the best parts of the Layon. This 2007 is showing very well at the moment with lovely pure citric fruit, especially grapefruit – all the precision and purity that is typical of the 2007 vintage. Naturally still youthful with the weight you would expect of 2009 with floral and grapefruit notes. Closed with a screwcap. Philippe's top dry white from vines on terraces created by Gaston Lenôtre in the early 1990s. Very clean with brilliant minerality. Philippe is happy to admit that the schisteous terroir of La Roulerie is not ideally suited to making red wine. 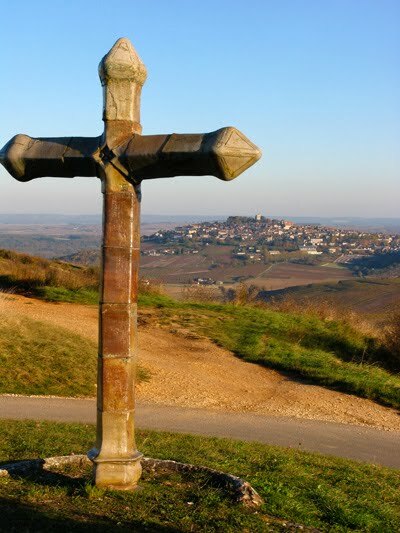 Indeed he would rather concentrate on the whites but his brother, Thierry of Domaine des Roches Neuves, urges him to continue to make red as well. In truth the Roulerie reds are pleasant and well made but they are ones to drink young, enjoy young and not to be taken particularly seriously. Philippe waited until around 20th October to pick when the fruit was fully ripe. Unusually this has 10% Cabernet Sauvignon blended in. Youthful black fruits with some structure and still attractive freshness in the finish despite the wine having 13-13.5% alcohol. Soft attractive, easy drinking fruit. The definite star of the evening a lovely sweet wine made by Dominique Jadeau – the last vintage he made before he sold Roulerie to Lenôtre. 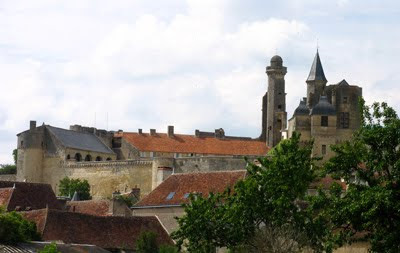 Medium gold – the 1990s took on colour very early – with rich dried apricot and peachy fruit and the typical Loire acidity that stops these rich wines being cloying. Very long flavour too. Really a wine to enjoy by itself instead of a dessert or after the end of the meal. 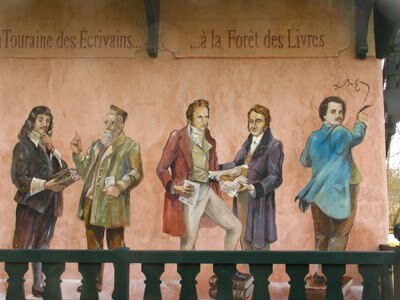 Rendez-vous à la 15ème edition de la Forêt des Livres sur le thème du "Romantisme". 150 écrivains et 40 000 visiteurs sont attendus sous les arbres centenaires. De nombreuses animations sont prévues durant la journée : remises de prix littéraires, dédicaces, dégustation de vins de Touraine auprès de nombreuses personnalités : Charlotte Gainsbourg, Charles Aznavour, Michelle Morgan... les meilleures plumes françaises seront au rendez-vous ! My weekly posting on Les 5 du Vin concentrating on Didier and Catherine's organic vineyards. That’s a protest in French. You might say it was a little too late after all the damn things have already been installed. But an email from an eager friend called us in to help swell the troops. 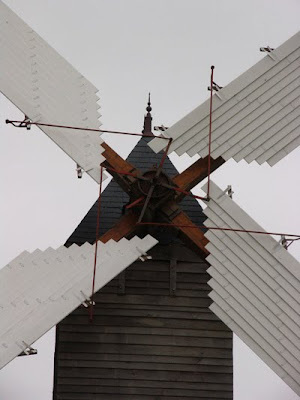 After all imagine how you would feel if four of these 120m tall things had been installed above your roof! There it is - the dreaded wind turbine or eolienne as they are known in France. A large lump of rotating metal that can be seen for 10’s of kilometers around embedded in an even larger lump of concrete. Metal that is slowly eating into the countryside under the ‘green guise’. Soon Anjou will be full of them if we don’t watch out. The promoters have plans for many more wind farms but the problem is there are only small groups in any commune prepared to fight against them. 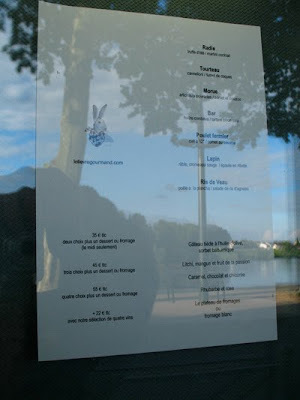 Last night was the first opportunity we had had to eat at Le Lièvre Gourmand since it skipped from the south of the Loire at Vailly-sur-Souldre to just onto the north side of the river on the Quai Chatelet in Orléans. 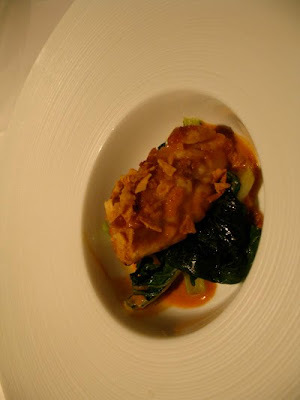 I'm delighted to report that nothing has been lost in the move – William Page's cooking remains as delicious and inventive as before. 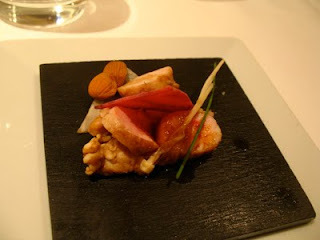 You choose three (45€) or four courses (55€) from seven choices plus dessert or cheese. Last night's were: Radis, Tourteau, Morue, Bar, Poulet Fermier, Lapin and Ris de Veau. My two stand out dishes were the radis with truffe d'été and martini cocktail and the ris de veau poêlé à la plancha with a salade de ris d'agneau. To drink we had Henry Natter's 2007 François de la Grange, Sancerre as our aperitif – good balance of fruit and crisp acidity. Then the rich and complex 1997 Clos Saint-Yves, Savennières, Domaine des Baumard which was an excellent match with out various first two dishes of crab, morue and sea bass. Then we moved to Australia – William Page was born in Papua New Guinea – for the 2003 Fotobolt Shiraz from d'Arenberg and the 2003 Cabernet Sauvignon, Clare Valley from Tim Adams. 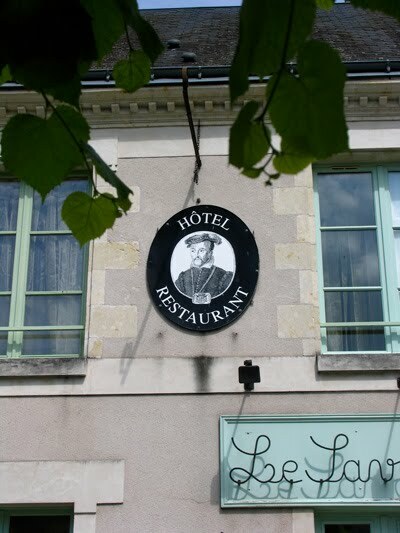 One word of warning – apart from the discreet menu in the window there is nothing to indicate that No 28 Quai Chatelet is a restaurant, so make a note of the house number before you set off. 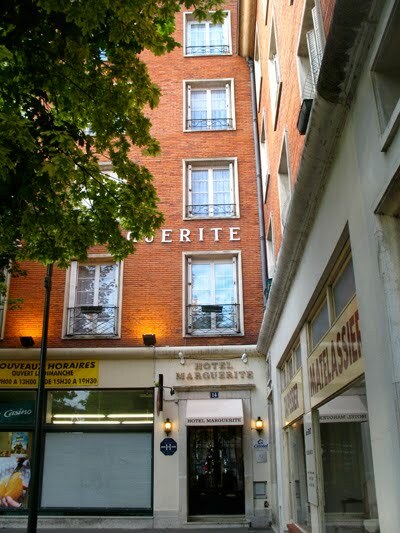 We stayed at the very comfortable, reasonably priced and central Hotel Marguerite about a five minute walk from the restaurant. The cold and wet weather of the last 10 days or more continues. After a little respite on Wednesday, Thursday was miserable, Friday at little better with the temperature rising in the afternoon to around 22˚C. 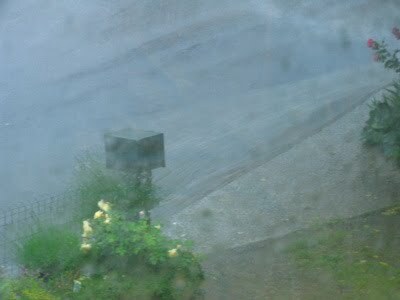 Today it is sharply backwards – wet with a temperature around 11.30 of only 11.5˚C for mid-June. Certainly not good for the vines' flowering. Reds made up the majority of the wines we tasted. I started with a short series of Touraine Gamay. 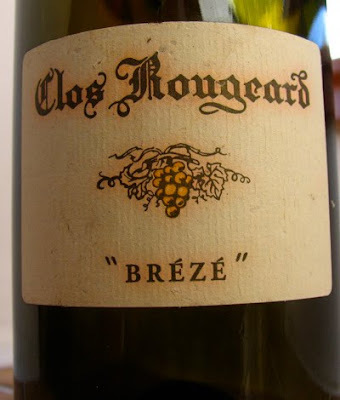 The 1990 Première Vendange from Henry Marionnet was one of two wines not from the Clos Roche Blanche and is an early example of a wine without sulphur. Now bricky in colour it had some Pinot Noir like aromas but was thin and fading on the palate. Certainly this bottle was over the hill. 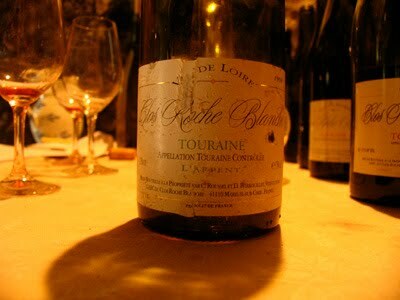 The 1995 Clos Roche Blanche was disappointing – also thin and faded. However, the 1996 that I have drunk with pleasure over the years was still showing well with attractive fruit, although perhaps beginning to dry a little in the finish. Still remarkable for a Gamay of 14 years old that is not normally expected or really designed to age. Equally remarkable was the 1999 with still dense, rich brambly fruit and length and probably good for another few years. Indeed the quality of the reds from 1999 was demonstrated by this tasting. Because of rain during September, 1999 has tended to be considered as an average vintage. 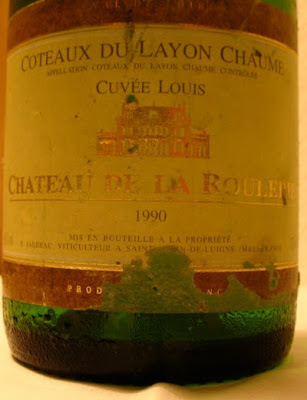 This tasting allied with a couple of Clos Roche Blanche 1999s – a Côt and a Closerie – have shown that these wines are now showing very well and that 1999s have turned out to be considerably better than anticipated. 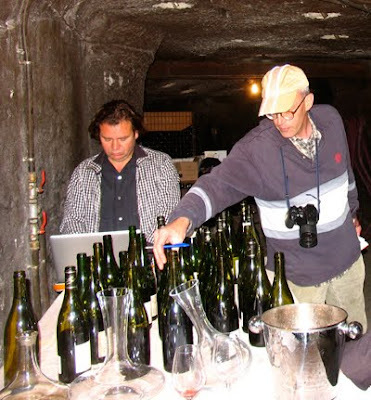 In contrast the 2005 Gamay was rather disappointing – mushroom aromas and quite tannic although it does have fruit. Perhaps it just needs a little more time! 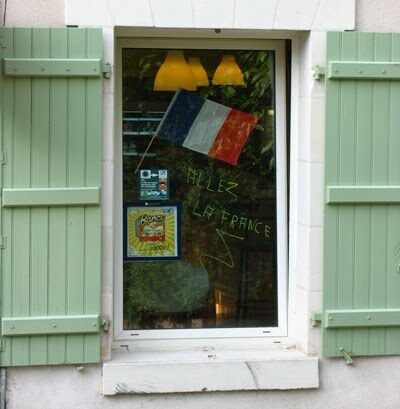 When I went to collect the bread this morning at Le Lézard Vert (Epeigné-les-Bois) I was warned by the three habitués, who take their coffee in the bar every morning, to say nothing about a football match played last night apparently between Mexico and France. 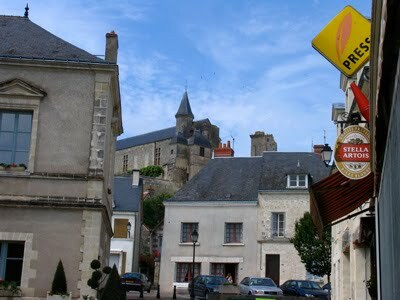 The Associations des Parents d'éléves de Luzillé et d'Epeigné are organising a moules frites evening on Saturday 26th June at Epeigné's Sales des Fêtes starting at 20h. Price: 9€ for an adult, 6€ for a child. Telephone 02.47.57.87.46 for a reservation. 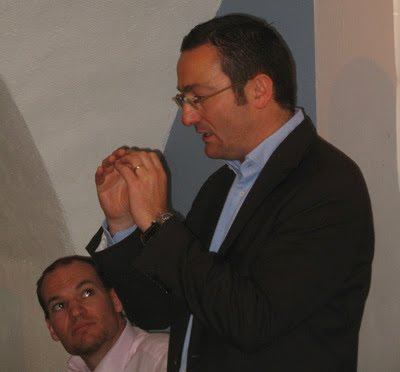 I learned today that François-Xavier Barc has left Charles Joguet and now plans to make his own wine in Chinon, Bourgueil or Saint-Nicolas-de-Bourgueil. I tasted from old to young, so I started with the 1998 L'Arpent, which is a field blend of Chenin Blanc (the majority), Arbois and grapes from a few red vines. This turned out to be one of my favourite wines. Sadly the vines have now been pulled out so L'Arpent is unfortunately no more. Light gold in colour this had just a touch of oxidation initially which only added to the complexity of the quite rich fruit with its aromas of white truffle. Lovely wine with some resemblance to a Romorantin which should last at least another five or ten years or more because of its supporting acidity. The 1999 L'Arpent was leaner, more mineral, while the 2000 was between the two styles with quite a lean finish and the likely capacity to age further. Not only is there no more L'Arpent white but under the bizarre new appellation Touraine regulations currently being concocted a complex and intriguing wine like this would no longer be allowed. 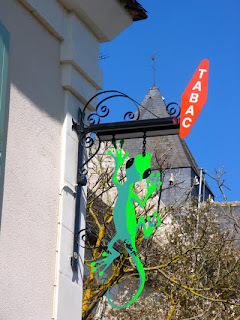 Clearly such wines are part of the local patrimony but will in future be outlawed from AC Touraine leaving only an ocean of Sauvignon Blanc. My other white star of the tasting was the 1995 Sauvignon Blanc that was still rich and mouth filling with a subtle touch of asparagus but not aggressive and still wonderfully fresh in the finish. This is a brilliant example to show that some Touraine Sauvignons form the Cher Valley can age extremely fine. Just forget about trying to find the varietal character and just enjoy it as a complete wine. The 1996 Sauvignon was also fine but not quite as good as the 1995. Today we held a big tasting of the wines of the Clos Roche Blanche arranged in several verticals with the oldest wine from 1987. A total of 42 wines were shown. 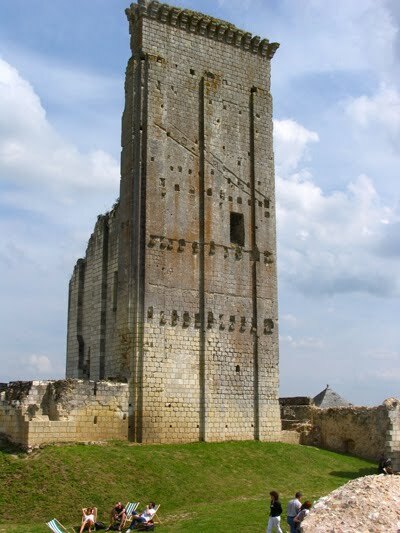 Although impressive verticals are relatively common in parts of the wine world, today's tasting was a fairly unique event for a Touraine producer in the Cher Valley. 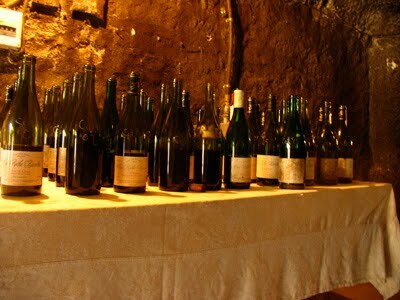 It is a testament to quality of the Clos Roche Blanche wines that although a few of the older wines were drying out there was hardly a complete dud. Even the 1987 Côt from a very difficult year was still there as a pale phantom. Otherwise perhaps the 1995 Gamay was closest to being off its perch – disappointing as the 1996 Gamay is still there are giving pleasure. 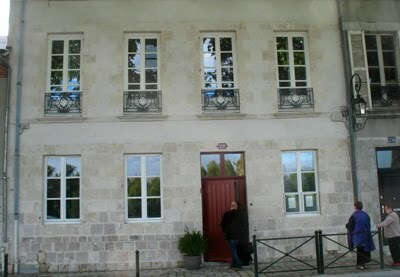 After our quick visit to the Moulin at Bléré we headed to Vouvray to taste some of the 2009 Huets. We kicked off with the 2009 Le Haut-Lieu sec (12.50€), which is decidedly austere, clean and precise at the moment with lightly floral aromas. (12.96% alc, 10.2 gms residual and 5.71 acidity). Although the 2009 Clos du Bourg sec has already sold out we were able taste it. It has more weight and concentration than Le Haut-Lieu, more complexity, a touch of honey and good length. It is less austere but also less precise. (13.72%, 8gm rs, 5.12 ac). The demi-secs are being held back for the moment, so it was straight onto the moelleux starting with the 2009 Le Haut-Lieu moelleux (15.50€)with 53 grams of residual sugar showing some quite rich, honey character with good length of flavour. Charming to drink at the moment. (53rs, 12.73% alc, 5.19ac). Next the slightly richer 2009 Le Mont moelleux (15.50€) – fuller and more weighty on the palate with hints of peach but a little disjointed at the moment. Ultimately I think this will prove to be the more interesting wine. (57.8 rs, 12.42% alc, 5.19ac). To come the 1er Tries – Le Mont and Clos du Bourg. 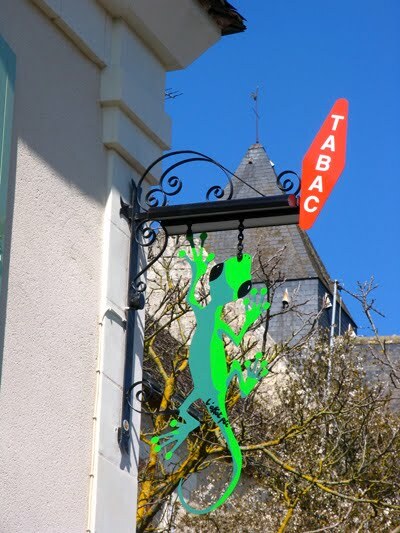 Top Touraine producer but discreet.. 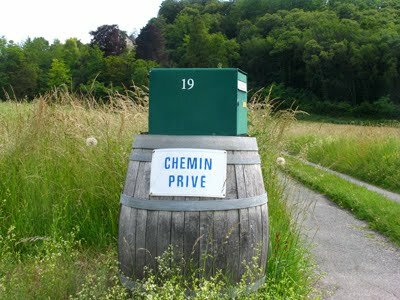 The discreet entrance to a top Touraine producer – a world away from the glitzy world of the Napa Valley or even parts of Bordeaux. You would have thought that mid-June would be warmer and more pleasant than this! 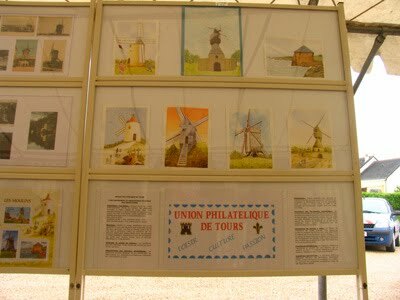 Sadly the big day for Bléré's mill when it featured on a new set of French postage stamps turned out to be grey and dreary. Nor was there allegedly enough wind to turn the sails, although to this untutored person there did appear to be quite a lot of wind available especially later in the day. I guess it all depends upon how urgently you need flour! Ready to turn but not enough wind! From having been very dry in April and May, June is now looking increasing wet. Rain very early this morning and a pretty miserable forecast for the rest of the week. Made a quick visit to see one of my favourite Cher Valley producers yesterday. "I've never seen so many cèpes in the woods at this time of year," they told us. 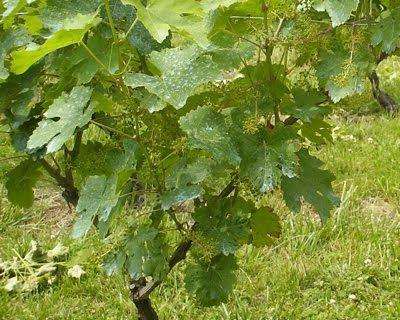 You can be sure that if the conditions are right for mushrooms, then they are right for black rot and mildew in the vineyards. Also it is the middle of the flowering – not good! 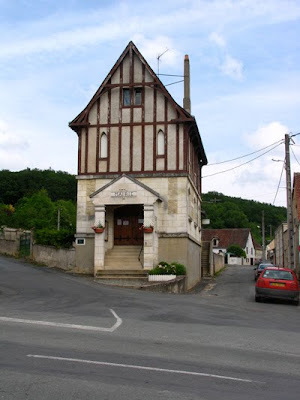 Here is my weekly posting on Les 5 du Vin. Not only do you eat well at La Promenade but you always drink well too as they have an excellent wine list. The Loire has a pride of place but there are also good things from Burgundy, the Rhône and Languedoc-Roussillon. The wines on the Frères Foucault have a significant place on the list and it wasn't difficult to decide to go for one of their whites from Brézé for our apero and first couple of courses. Xavier Fortin, their fine sommelier, recommended with any hesitation the 2000. I sure he was right as this complex wine was showing very well with honey, butter and vanilla notes and some minerality in the finish. 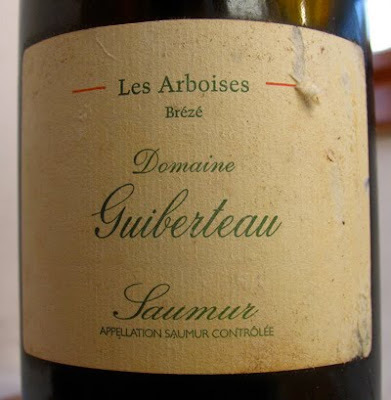 Top white Saumur can provide white Burgundy with fierce competition. Xavier Fortin, La Promenade's sommelier, had mentioned when we arrived that there would be a group of producers from the Loire and elsewhere in for lunch. Among those he mentioned was Romain Guiberteau. 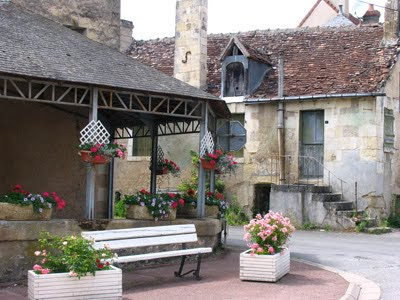 On several occasions I have tasted the Guiberteau wines at the Salon des Vins de Loire but never yet got round to visiting them nor drinking one of their wines. When I saw this 2003 on the list I decided this was the moment. It proved to be fortunate as this was the last bottle on the list and it turned out to be a lovely opulent 2003 – rich and softly textured black fruits. Who said that the 2003s would rapidly fall apart?! Epeigné's epicerie/bar has got into the spirit of the World Cup with French flags and slogans on the windows and plenty of good-hearted banter when I go to collect the bread in the morning. 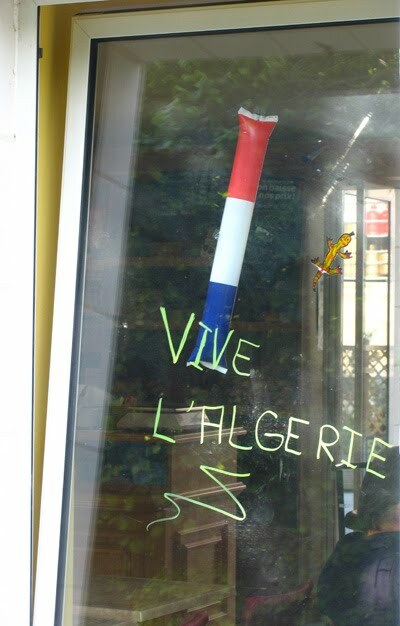 Although none of the three teams – France, Algeria and England – with known support have managed to distinguish themselves so far. 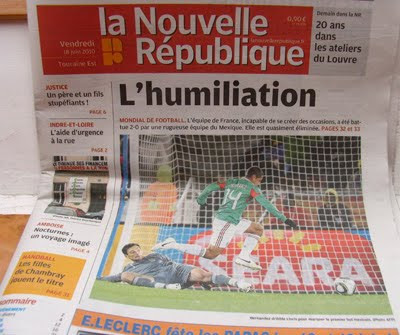 Despite the good humour it may be best not to remind Nacer that Algeria lost to Slovenia on Sunday. Friday looks to be the big crunch match – Algeria versus England – with both teams needing to win to keep their hopes of progressing to the next round. 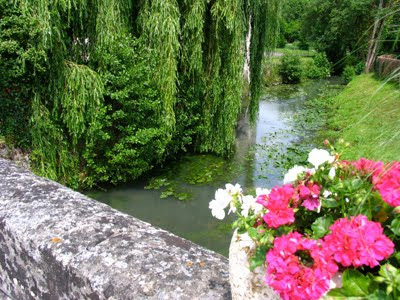 Today we went out for a splendid Sunday lunch at Jacky Dallais' La Promenade in Le Petit Pressigny. It is always excellent and each time we wonder why we don't go more often because it also such stunning value for the quality. Being over 50 kilometres away is a large part of the answer. 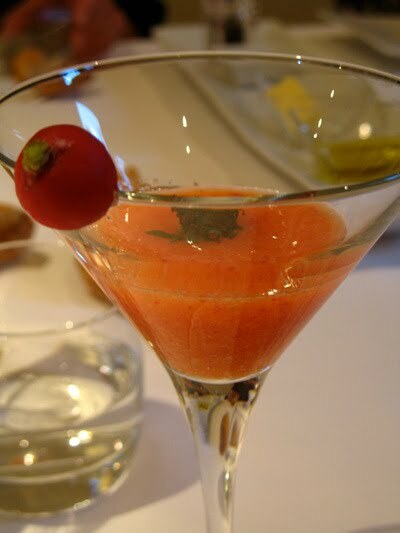 Why La Promenade isn't more than a one-star Michelin is beyond me. It is, however, just as well because the service is discreet and efficient even during a busy Sunday lunch and Jacky Dallais stays in his kitchen producing his magic rather than playing the celebrity chef and touring the tables. 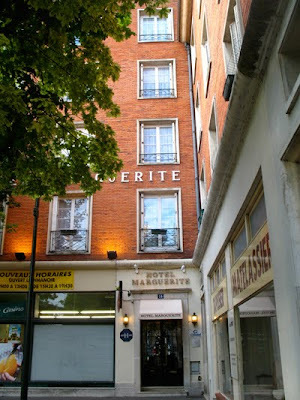 I will be writing more about La Promenade, our lunch and the wines for my Tuesday piece this week on Les 5 du Vin. See a posting here on a previous lunch@La Promenade and one from Jacqueline Friedrich. 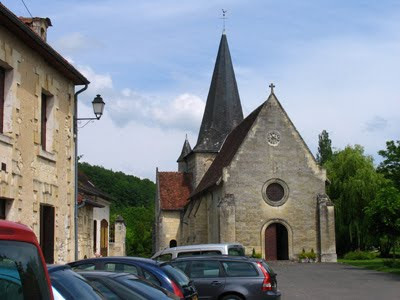 After lunch I took a few photos around the village of Le Petit Pressigny and then we headed off for a quick look at Le Petit's grown-up brother Le Grand Pressigny and its museum of pre-history.